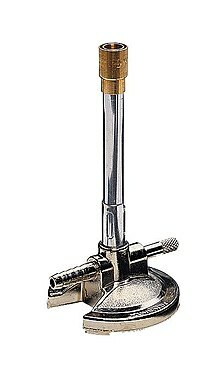 A Bunsen burner is a common piece of laboratory equipment. It is commonly used for heating chemical substances, sterilization, and combustion. It works by burning flammable gas. It is named after Robert Wilhelm Bunsen, a German chemist. He made important improvements on an earlier burner invented by Michael Faraday. The Bunsen burner can be adjusted to make a flame that is very hot without making much light. This allows seeing the different colors that various chemicals make when they are sprinkled into the flame. This page was last changed on 12 October 2018, at 20:37.